Gurdev Nidar Singh will be back in Oakland for a seminar on the weekend of October 21 & 22 , 2017. Please click here to register as soon as possible - space is limited. Sanatan Shastar Vidiya is the ancient battlefield science of India, of which Gurdev Nidar Singh is the last living grandmaster. Tried and tested on the battlefield through history, it has a unique understanding of combat and body mechanics, including an entire science of how to stretch, strengthen and activate the body’s fascia to generate a type of non-muscular or “internal" energy. In this seminar, Gurdev Nidar Singh will teach you how to generate this internal energy, and how to use it to enhance the power, stealth, and efficiency of armed and unarmed combat techniques. 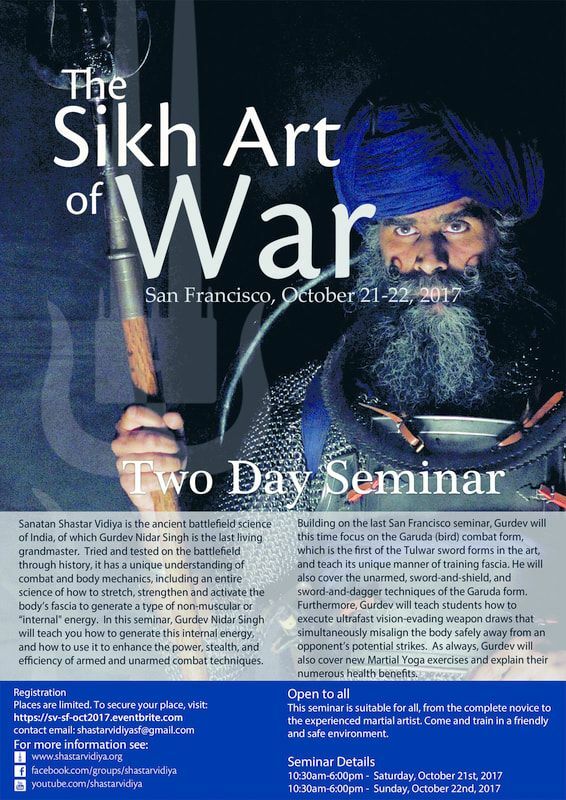 Building on the last San Francisco seminar, Gurdev will this time focus on the Garuda (bird) combat form, which is the first of the Tulwar sword forms in the art, and teach its unique manner of training fascia. He will also cover the unarmed, sword-and-shield, and sword-and-dagger techniques of the Garuda form. Furthermore, Gurdev will teach students how to execute ultrafast vision-evading weapon draws that simultaneously misalign the body safely away from an opponent's potential strikes. As always, Gurdev will also cover new Martial Yoga exercises and explain their numerous health benefits. The seminar will once again be held at the In Motion Center in Oakland. As always, we welcome efforts to spread the word among the wider community.